Period of creation 2016-01-08 to 29 and 2016-02-16 to 23 and 2016-06-21 to 2016-07-20 and 2017-01-27 to 31 and 2017-04-10 to 18 and 2018-05-02 to 29 and 2018-07-20 to 24. 2011-11-29 to 2012-03-24 and 2012-07-01 to 2012-09-03 (early fragment). Duration 15 min (early fragment: 5 min). Commission / occasion Early fragment: Commissioned by the Ensemble intercontemporain and IRCAM (Fra) within the frame of the Tremplin Commission Program 2012. Full version: Commissioned by the Oslo Sinfonietta (Nor), funded by Det norske komponistfond (The Norwegian Composers’ Fund) (Nor). Eisregen is the German term for Freezing rain in English or Pluie verglaçante in French. Freezing rainis made of liquid but supercooled droplets which instantly freeze on impact with the ground or any kind of solid material on the earth’s surface below 0°C. When large quantities accumulate, the affected trees and plants, road­ways and power lines, vehicles and all sorts of engines can be covered, already in a short time, by a layer of ice (called glaze) several centimetres thick. As an effect, trees and power lines may break under the weight of the heavy ice, frozen roads make vehicles lose traction and slide and in the end, all plants or engines, all living organisms imprisoned by the ice coating lose their breath of life, at least for a while. 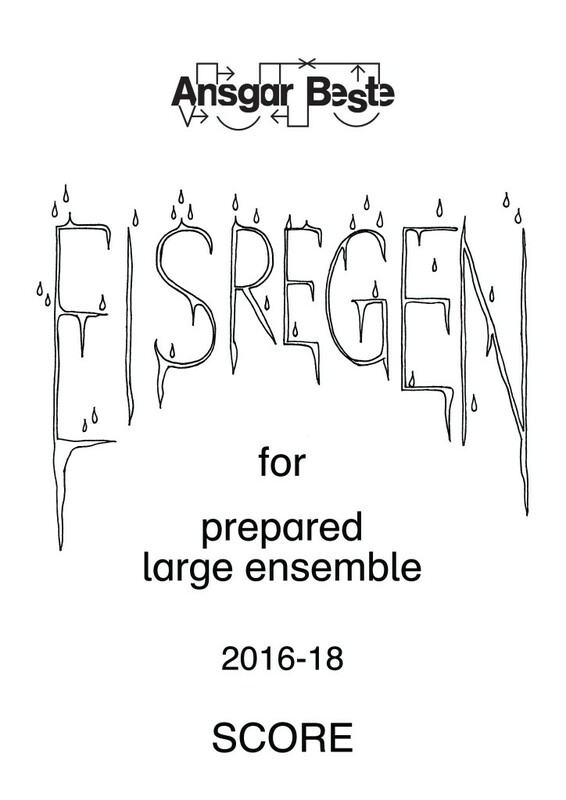 The main idea of the composition Eisregen for prepared large ensemble (2011/12) is to represent this dialectical interaction between the meteorological phenomenon on the one side and its effects on humankind, nature and technology on the other side by a dialectical interaction between two major sound centres: dry and granular sounds versus more resonant and con­tin­u­ous sounds. The continuous sounds might stand for the meteorological process: They develop from gong sounds (raindrops?) to fluido sounds (impact with the ground?) to whistling sounds (congelation?) and finally to distorted sounds (increasingly threatening glaze?). The granular sounds may be related to the effects of the freezing rain: Starting with constant repetitive scraping (traffic flow or rhythm of life? ), they transform to repetitive attacks of al nien­te rat­tling (decreasing energy?) and end up in single attacks (loss of the breath of life?). The total duration of the composition (15 min) is equally distributed between two different compositional strategies: on the one hand, a dynamic or conflictual metric and syntactical behaviour between upbeats, downbeats and sustained resonances with different hierarchies. And on the other hand, a mechanic or uniform perpetuum mobile rotating like a gearwheel: out of a limited number of simultaneous sounds, a single sound always disappears, when a new one enters. Both compositional behaviours alternate in time and combine sounds from both sound centres. However, the dynamic attitude, dominant in the beginning but gradually thinning out to occasional intermezzi, may represent the dialectical pole of the breath of life, whereas the mechanic attitude, proceeding from intermezzi to predominance, might illustrate the opposite pole, the merciless and unstoppable natural process triggered by the freezing rain.